75% of today’s S&P 500 companies will be replaced by 2027. It’s a tenuous time to be a marketing leader. And many of the strategies that have worked in the past are no longer relevant. We partnered with top marketers from the world’s biggest companies to understand how they’re adapting to this new world and rewiring their organizations. In this whitepaper, you’ll learn how companies like Microsoft, LVMH, and IBM are approaching digital transformation. 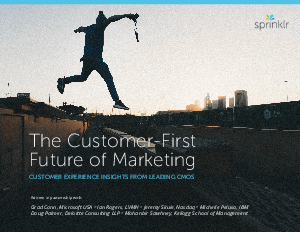 To learn new marketing strategies for a customer-first world, download the whitepaper.